LOC is delighted to be sponsoring The 21st Annual Salvage & Wreck conference will take place in London from the 5th to the 7th of December. 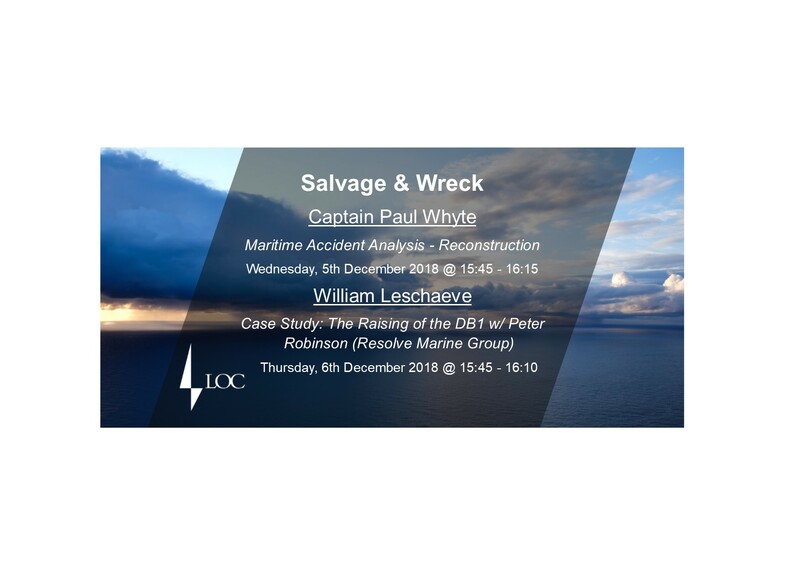 On Wednesday, 5th of December 2018 at 15:45, Captain Paul Whyte, Shipping Technical Director Navigational Services from LOC London, will be presenting, “Maritime Accident Analysis – Reconstruction”. The presentation will explore the role of electronic data in analysing marine accidents. Will Leschaeve from LOC’s New York office will be presenting on the 6th of December 2018 at 15:45. Will is presenting a case study alongside Peter Robinson from Resolve Marine Group, they will be discussing LOC’s involvement in the DB 1 wreck removal, “The Raising of the DB1”. The conference is the world’s largest gathering for salvage professionals and LOC is very excited to be a part of it.